As promised long ago, here is my favorite picture from our last ultrasound. 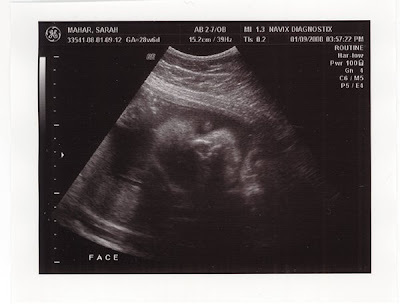 You can see Baby's face so well...and she's darn cute, if I do say so myself. :) She's still super wiggly and Joshua and I are getting more and more excited to meet her. Each day that goes by I find myself wishing that she would hurry up and come. And then I remember that we still have a few things to get done first--so she can wait a few more weeks! Courtesy of one of my fellow mommies at Christ Church, I went to Paula's Day Spa today and had a fabulous spa manicure. Really, manicures are one of my favorite indulgences. They are so relaxing and make me feel very feminine. So today I pampered myself a bit--and man was it awesome! The gal who did my nails did a great job and I just about starting drooling during the hand massage. Oh, if only I could have this done more often! Today was also my baby shower! Meredith and Johanna put together a very elegant and fabulous shower, and I was so happy to be surrounded by women I love and respect. It's always hard to get a chance to really sit down and talk with everyone at showers/parties, but I was so thankful to have them all there to celebrate the upcoming birth of our daughter.